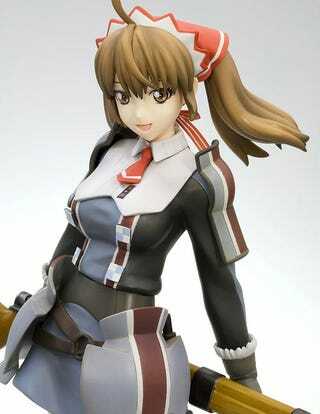 The last few Valkyria Chronicles figures we've seen were for baddie Selvaria Bles. Time to even the score, with a figure of heroine Alicia Melchiott. This gorgeous figure is made by Kotobukiya, and will be released in Japan in December for around USD$80. That's not bad considering you get an exquisite 210mm figure of Alicia, but also included is Hans, the cutest swine in all of Gallia.